Remote Deposit Capture Plus is a unique electronic processing program with check guarantee and other benefits that enable businesses to increase sales, mitigate risk, save time and money, and simplify transactions. Checks are easily and quickly processed using a PC and imager. Enhancements for auto dealerships are available with C.A.R.S., CrossCheck's Auto Industry RDC Solution. 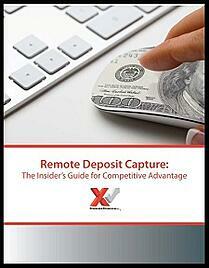 Contact us today to learn how Remote Deposit Capture Plus can streamline guaranteed payments at your business. "Guarantee mitigates the risk of accepting checks while remote deposit capture saves time and money because of fewer trips to the bank."